Nadine is preparing for an event-filled summer! Check back for more information regarding future events. Nadine's catering and flower design are showcased in the Fall/Winter 2012 edition of The Knot Georgia. She provided these services for the wedding of Chelsey Chastain and Jason Hogan in spring 2011 at Smithgall Woods-Duke's Creek Conservation Area. Nadine was proud to host a retirement celebration on December 16 for her husband, Tom Wardenga. The event acknowledged his 34 years of service to the state of Georgia's Juvenile Justice Department. In honor of this special milestone, attendees brought canned food items to benefit the local food pantry. Nadine provided exclusive floral arrangements for a meeting of the National Association of Secretaries of State hosted by Georgia Secretary of State Brian Kemp on October 17 in Atlanta. She was presented with an Outstanding Georgia Citizen Proclamation (left) in recognition of her efforts on both the state and local levels. Nadine was invited to conduct a Kitchen Demonstration of Nadine's Classic Cuisine at the Sunbelt Agriculture Expo. She and her products appeared on Tuesday, October 18, 2011 from 3:00-4:00 p.m. To view Nadine on the Sunbelt Ag Expo's short video, click here. Nadine appears at the 4:33 mark. The Sunbelt Ag Expo is an agricultural-based trade show held at Spence Field in Moultrie, GA. Known as North America's Premier Farm Show, the annual event had more than 1,200 exhibitors showcasing the latest in farming technology. Nadine was one of eight Georgia entrepreneurs invited to the Showcasing Georgia Agriculture event at the Georgia State Capitol on Thursday, August 18, 2011. She was the only entrepreneur located north of Macon invited to attend the event. See photos and video from the event below. 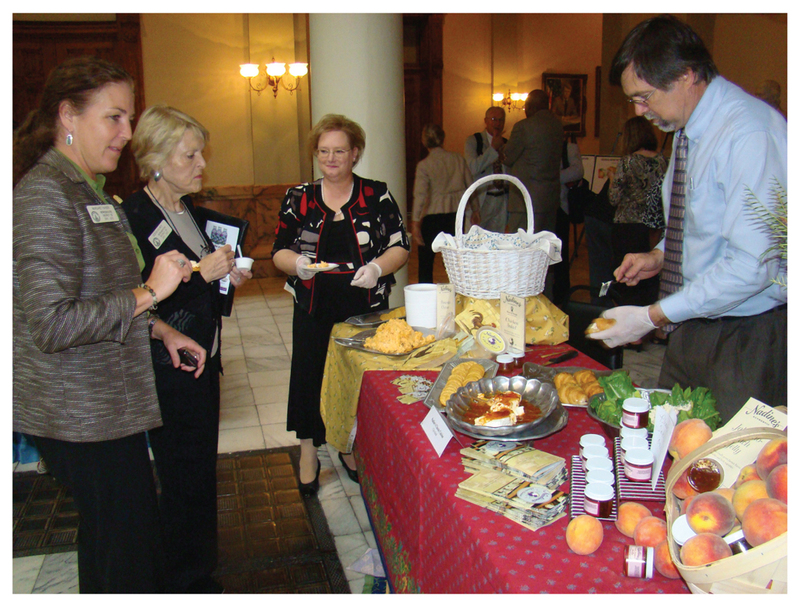 Nadine and her husband, Tom, give samples of her Pimento Cheese, Chicken Salad, and other specialties to state representatives. Nadine with Secretary of State Brian Kemp. To view Nadine on the Georgia Department of Agriculture's short video of the event, click here. Nadine appears at the 4:50 mark.